When I'm heading to events as the Editor in Chief of Kitten Lounge and I have the opportunity to ask a designer why they wear what they do, I tend to hear the historic response. People love wearing something that has a meaning or a soul in many respects. This is generally found when you wear heirlooms or go to an antique shop. Suffice it to say, that pieces found or obtained in these areas have a story and a heft. There is a way that you look at them and you're able to gravitate to them. So I'm glad to see that these elements are finding their way into pieces that are brand new. JCrew is in the midst of various collaborations with artists such as Fenton and Fallon which is known for their love of antique, edgy and femme qualities. This Crystal Rock Bracelet is not within this collaboration but is available on J Crew and is the perfect piece to wear with a number of outfits regardless of where you're going. My computer will be pried from my cold, dead hands. I'm on it all day, and have palpitations when I'm separated from the Internet for too long. I carry a smartphone just so I can always be "in touch." Like most computer addicts, I never wear bracelets. Still, I keep noticing that at dinner, or at parties, my friends have these lovely ornaments on their wrists. They must, I think to myself, have a life! 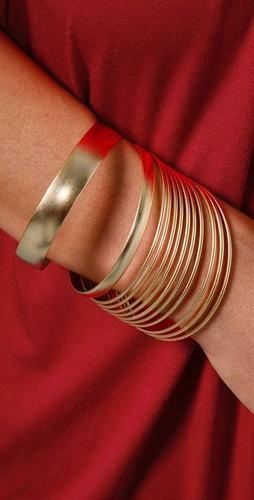 Recently, I noticed my friend's mom wearing a set of gorgeous gold bangles. My best friend's mother is from Israel and every time she visits Tel Aviv she brings back the most amazing jewelry. She says she's had the bangles forever, and that's probably true. Still, they look new and fresh and really tasteful. I found the set pictured above after an extensive search. Apparently they're not so hot in the U.S., which is weird, since nothing looks more svelte with a slim-fitting black cocktail dress than gold bangles. Well, unless diamonds are involved, and that's a whole other level! Photo above is from Shopbop.com. You're fighting rush hour traffic to make it to the dry-cleaners to pick up the shirt you absolutely have to wear to work tomorrow. You pull into the loading zone and put on your blinkers. Five minutes later, dry-cleaning in hand, you have a parking ticket. Problem: evening ruined by very bad mood. Solution: buy yourself a present to cheer up in amt. equal to parking ticket. Juicy has been coming out with some really cute jewelry but nothing beats their adorable charm bracelet available here and here. I spotted this cupcake charm right off the bat (if you can't eat one, why not wear it!). For about $75 you've gotten a great new bracelet to wear with your dry-cleaned shirt. And this store has lots more charms so you're ready for a little pick-me-up next time you forget to feed the meter. The Caribbean Hook Bracelet first became popular on St. Croix in the U.S. Virgin Islands to celebrate love and good fortune. Recently, the islands of the Caribbean have adopted the Hook Bracelet as their signature piece. The traditional horseshoe design was introduced to the Caribbean over forty years ago, and since then, new island bracelet designs have become very popular, including the Fish hook, Knot, Lizard, and Dolphin and many others. Caribbean Hook Bracelets are now worn by people all over the world. Whether you call it a Love Bracelet, or an Island Bangle, there is only one Original Hook Bracelet with a patented integral locking clasp. Sterling Silver with 14k Gold wrap. Handcrafted gold and sterling silver hook bracelets are made in the Caribbean and have a unique style all their own. Folklore has built up around the bracelet's simple horseshoe design. If you wear the open end of the hook pointed up toward your heart, it means your love is taken, and that good fortune will come your way. If you wear the hook away from your heart, it signifies that you are available, and that you're sharing your good fortune. Children have been known to say that sand dollars are the money of mermaids washed-up from the deep. This stunning sterling silver bracelet with 14k gold wrap and sand dollar will remind you of the times spent trolling the sandy shores searching for the shells of these delicate sea creatures. Sometimes the men of a Caribbean village have to leave to fish or deliver goods to other islands in order to make a living for their families, often for weeks at a time. When the men set out to sea, their wives wear their bracelets with the open end of the hook pointed away from their heart and down their out stretched arms, sending love and faith as they wave goodbye to their husbands. When the men return and their ship is spotted in the harbor, their wives turned the hook up toward their heart, symbolizing the safe return of their men from the dangers of the Caribbean. In many historical cultures, palms were symbols of victory, peace, and fertility. Today, palms remain a popular symbol for the tropics. You will remember your vacation to the islands every time you look at this stunning sterling silver palm tree bracelet with 14k gold wrap. The aesthetic value and therapeutic power of magnetic bracelets have gained more recognition and popularity, because they are believed to improve health by increasing blood circulation. In recent years, Titanium has found its way into fashion jewelry, because it's lightweight, tough, corrosion-resistant, and biologically compatible with the human body. Titanium is 45% lighter than stainless steel and nickel free, which makes it perfect for fashionable and healthy magnetic jewelry. Most of the Titanium bracelets I've seen are plain gray metal links – no style, no personality. But these I love. They're stylish, they're magnetic, and they're Titanium! These titanium magnetic bracelets are made of Commercially Pure Ti2 grade titanium – an ultra-light premium metal that is hypoallergenic and extremely comfortable to wear. And there's a magnet in every link. Magnet therapy was rediscovered in the 1950s in Russia and Japan. Space research has shown what happens when human beings are removed from the influence of the earth's magnetic field for any length of time. Scientists observed that Russian cosmonauts suffered from significant osteoporosis and severe depression upon their return to earth. These phenomena have been appreciably reduced by incorporating artificial magnetic fields in space ships and space suits. Today five million Americans – including Bill Clinton and Sir Anthony Hopkins – swear by magnet therapy. The earth's magnetic field has decreased considerably over the last 500 years. Dr. Nakagawa (Tokyo) wrote an article in 1976 in which he described a condition he called magnetic field deficiency syndrome. Symptoms include stiffness of the shoulders, back pain, headaches, fibromyalgia, disturbed sleep, digestive problems, circulatory problems, and general fatigue. Dr. Nakagawa asked 11,648 users of magnet therapy about their experiences. Over 90% rated magnet therapy as effective and only 10% as ineffective. No side effects were reported. Our life in concrete and steel buildings, cars, trains, planes, etc. also reduces the effect of the earth's magnetic field. A further disruptive factor is the electronic smog caused by computer screens, radios, TVs, mobile phones, etc. There are many schools of thought and countless studies on the positive effects. Some doctors believe that the magnetic field affects the iron component of blood, hemoglobin, thereby increasing circulation to the area where magnets are applied, and the more blood to the area in pain, the more it helps it heal. Many people active in sports have asked for a lightweight magnetic bracelet that would not affect their playing performance. The most vocal have been golfers, who suggest that heavy stainless magnetic bracelets can adversely affect their swing. With titanium, they can have a substantial bracelet at a fraction of the weight of stainless steel, still enjoy the benefits of the magnetic properties, and have a piece of titanium jewelry that will last for years. 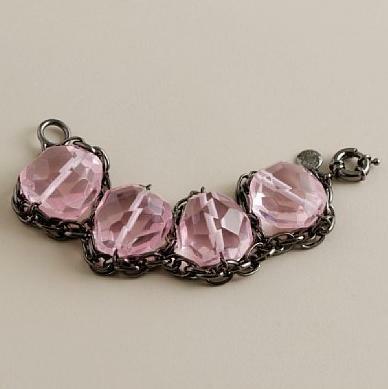 Victorian-style slide bracelets – sometimes called slide charms or sliders – are unique collectibles that make great gifts. Or they can become a treasured heirloom in your family. You can choose from 14 karat yellow or white gold and from a selection of stones: Amethyst, Blue Topaz, Citrine, Garnet, Peridot, cameo, and more. Each slide is made with holes to slide onto a chain bracelet. Rainbow slide bracelet featuring Garnet, Peridot, Amethyst, Citrine, Blue Topaz, Garnet, Peridot, Citrine, and Amethyst slides with our bulls eye clasp. During the Victorian Era, 1837-1901, jewelry became more commonplace due to a growth of wealth in the middle class. Successful businessmen displayed their wealth by buying expensive jewelry their wives. Some women from that era wore hunting case watches around their necks on long chains with a decorative slide on it. The slide allowed them to adjust the watch to a specific position. Wristwatches eventually replaced necklace timepieces, and antique enthusiasts began collecting those watch slides around the 1930's and making them into bracelets. They cut the slide off the watch chain and strung it on a double-strand chain bracelet. Eventually, they collected enough to complete a full bracelet. The Victorian style slide bracelet was born. Over the next several decades, slides became lighter, and designs became more modern. In the 1990s, reproductions of the Victorian Era slides became popular again. Charm Bracelets change in looks over time, but they never go out of style. There are thousands of charms to choose from, with many themes. Some high fashion names such as Louis Vuitton and Juicy Couture have begun issuing their own collectible charms. 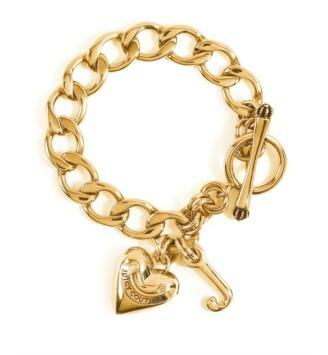 Moschino stainless steel bracelet watch with Italian heart and handbag charms. 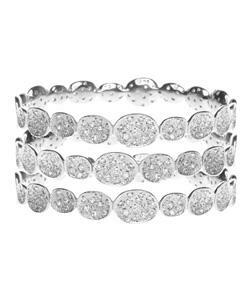 This polished bracelet adorns the wrist with fun and sophistication. In 2001, a new fashion was launched for Italian charm bracelets, in which the charms are snapped onto the body of the bracelet rather than dangled from it. Italian charms are flat, modular links that hook together to form a charm bracelet, key chain, or other accessories. Modular bracelets and charms are beautiful and versatile. The modular design means that the charms are interchangeable. An individual Italian charm can be switched out for a new look or to better suit the mood or changing interests of the wearer. A starter Italian charm bracelet consists of eighteen blank links. 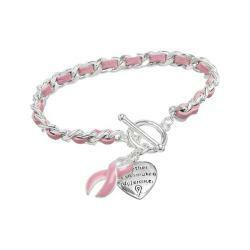 In order to create a personalized bracelet, the blank links are replaced with Italian charms that are flat, modular links that hook together. While traditional charms dangle, Italian charms feature individual pieces soldered flat onto the surface of the link. The charm bracelets stretch to fit over your hand for ease in taking them on and off. It can fit either loose or snug, depending upon your preference. Our starter bracelet has 14 links & is available in your choice of Shiny, Matte, or Diamond design. You can wear the story of your life on your wrist. Each time you hit a new milestone, simply add a meaningful charm. Add charms that commemorate the important events in your life, symbols that reflect your deepest heartfelt beliefs, or the cherished people who have helped you along the way.